Andrew Conte comes to Point Park University from the Pittsburgh Tribune-Review, where he was an award-winning investigative journalist. He has spent the past 12 years as a part-time professor at Point Park and director of the Point Park News Service. 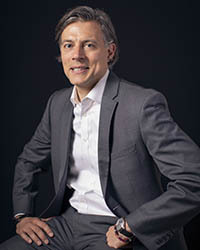 In May 2016 Conte was named the director of the University's new Center for Media Innovation. He is an author and was a contributing writer for the Pittsburgh Tribune-Review. "'The Color of Sundays,' by Andrew Conte, tells Nunn's 'story,'" New Pittsburgh Courier, September 2018. "Pitch your story to this new crowd-sourced journalism project and win money to write it," NEXTpittsburgh, May 14, 2018. "Finish lines: Andrew Conte," Mt. Lebanon Magazine, March 23, 2017. "New book for the younger set details Pirates' legend's life on and off the field," TribLive.com, Jan. 23, 2017. "Woman Sues Parents Over Embarrassing Childhood Photos Posted to Facebook," KDKA-TV, Sept. 15, 2016. "Why Do You Value Local News?," Pittsburgh Tribune-Review, Sept. 13, 2016. "A Conversation with 'Serial's' Sarah Koenig," WESA 90.5-FM, Sept. 9, 2016. "Point Park University to Unveil New Center for Media Innovation," Pittsburgh Post-Gazette, Sept. 7, 2016. "Journalism Remains a Passion Pursuit for Point Park University Students and it's Newest Director," WESA 90.5-FM, May 27, 2016. How do Pittsburgh's online news sites measure up? Should I cancel my subscription to the Post-Gazette?! Introducing our new media column. Because good journalism is more important than ever.